Jon Land’s latest Caitlin Strong novel starts in the small Texas town of Smokeville, in the year 1919. A terrified young boy, barely alive, wonders aimlessly into town, his face speckled with blood, looking like he has just seen hell. His tattered clothes are a possible testament to that, smelling badly of fire or its aftermath. The boy is spotted by local constable, John Rob Salise, who gives him some much-needed water. The boy devours it, almost choking on the liquid lifeline. Salise then tries questioning him, but gets no response. The paper turns out to be a drawing, possibly by the boy, showing man-sized skeleton figures wearing pistol belts and bandoliers. Some of the skeletons in the drawing are wearing sombreros over their exposed skulls and some didn’t. It eventually transpires that the boy possibly has knowledge of a drug cartel smuggling opium across the Texas-Mexico border, and god help anyone getting in their way—even if they are the legendary Texas Rangers. Guajardo stopped half in the sun and half in the shade, her back to the children. “What are we supposed to be seeing, señora?” the oldest boy prodded. On the other side of the coin, fifth generation Texas Ranger Caitlin Strong and her sometimes lover and former outlaw Cort Wesley Masters both survive terrifying gun battles. But this time, it turns out, the actual targets were not them, but Masters’ teenage sons, Dylan and Luke. That sets Caitlin and Cort Wesley off on a trail winding through the past and present with nothing less than the future of the United States hanging in the balance. Along the way they will confront terrible truths dating all the way back to the Mexican Revolution and the dogged battle Caitlin’s own grandfather and great-grandfather fought against the first generation of Mexican drug dealers. But this time it’s not just guns and bullets she is up against. Caitlin must win in cyberspace as well as on land as sabotage proves to be an equally deadly weapon. Her only chance to prevail is to short-circuit a complex plan based as much on microchips as bullets. Because there’s a strong rain coming and only Caitlin and Cort Wesley can stop the fall before it’s too late. Jon Land is in fine form in this riveting installment of the Caitlan Strong series. He knows how to deliver a high-octane adventure mixed with masterly story telling and characters we care about. Caitlan Strong is a wonderful creation, and it’s to Mr Land’s credit he keeps her real and human, someone we can all cheer for. 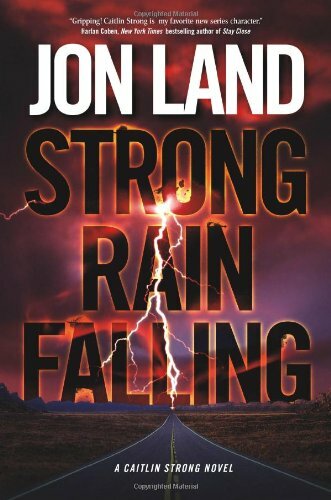 Strong Rain Falling is the best Strong novel thus far in the stellar series.